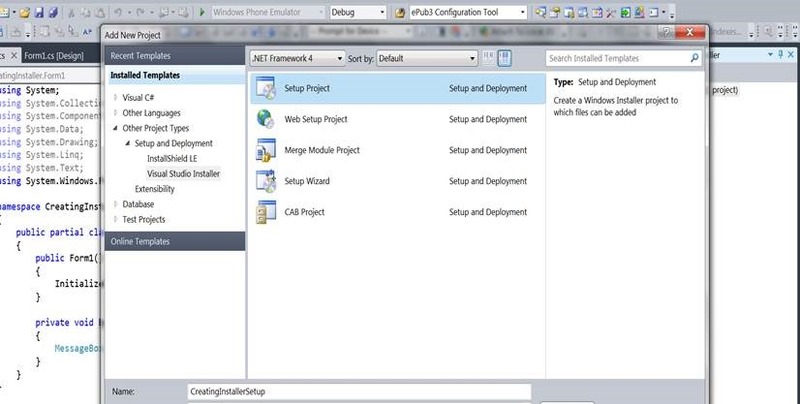 There are a number of ways provided by Microsoft to create a setup project for windows application. But when I started to create one, I got nothing but queries and confusions of how to start and where to start. There are numerous articles I found over the network, explaining to create a setup project, but some do not work as they say, and some do not have a live example to follow. In this article I would like to explain a step by step process to create a windows application and a setup installer for the same in a very simple manner, that is easy to understand and follow, alternatively, there are n no. of ways to do so. 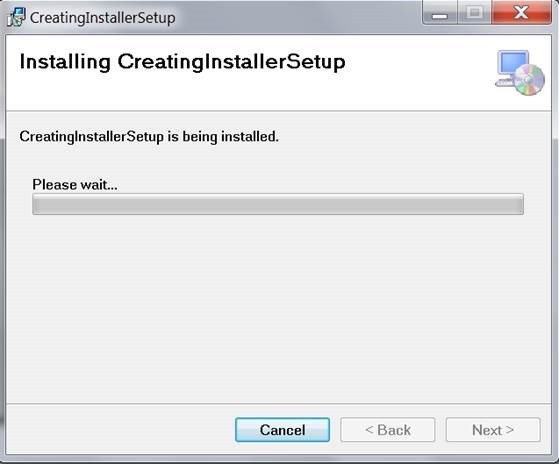 I gave the name CreatingInstaller to my windows application, obviously, you can have your own. 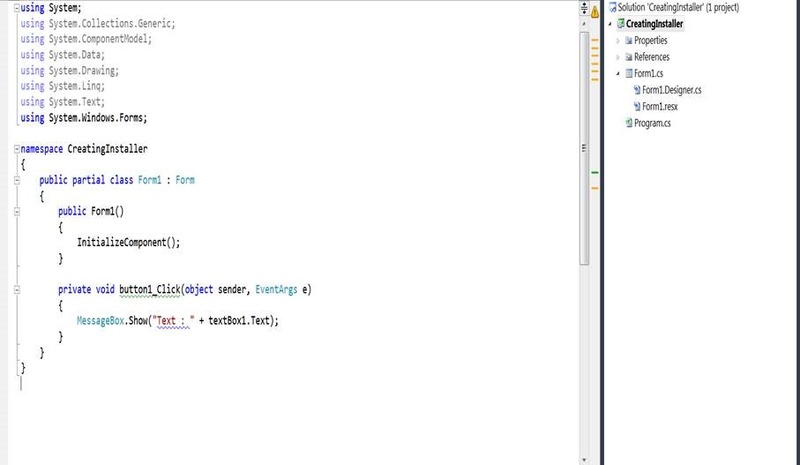 The Primary output will be added as shown below, having the type defined as Output. In the meanwhile lets add some more functionality to our windows application, lets read a file and show its output in a message box on button click. Therefore, just add a text file, I called it Sample.txt to the bin\debug\Input folder, Input is the custom folder I created to place my txt file. 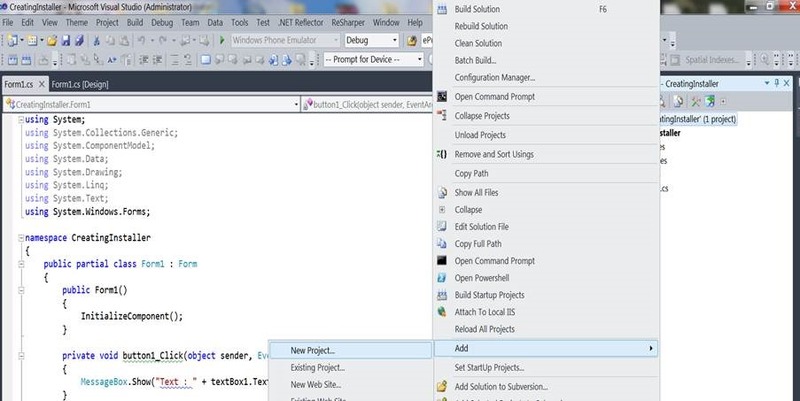 Write few lines of code just to read the txt file from Startup path, in my case bin\debug, it could also be bin\release as per project build, and specify the file folder name and file name to read the content.I chose to keep my txt file at startup path so that I could explain how we can create files and folders at the time of installation. Now we also need this Input folder and a Sample.txt file at the time of installation to be located at the location of installed application. For file operations, I added the namespace System.IO, needless to specify this thou. 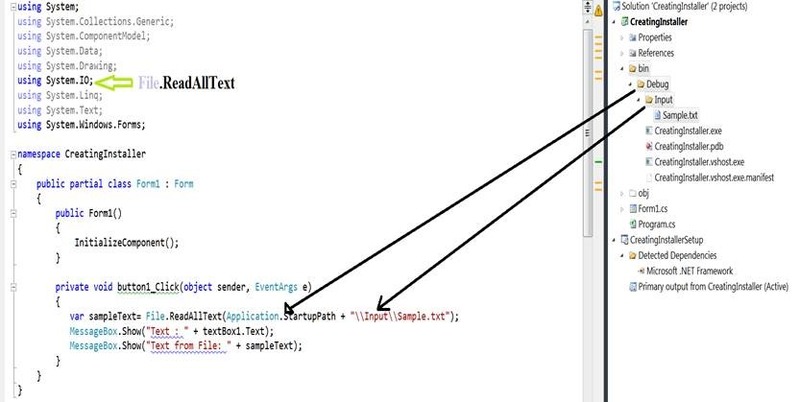 Therefore running the application will show two message boxes one after another showing text box text and text from Sample.txt file. 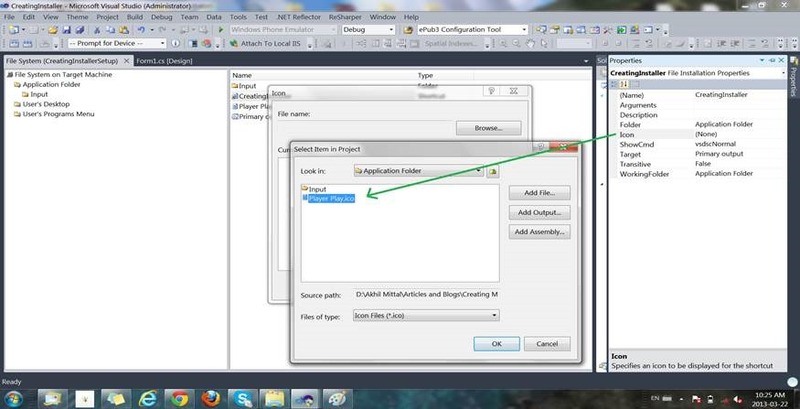 To create a shortcut to the application, right click on Primary output in the middle window pane and select Create shortcut to Primary output, the name that shortcut as CreatingInstaller. Select the properties of the shortcut, by right clicking it and add an icon to it. This icon will be created at the desktop when the application will launch. Below figures explain how to add an icon. Cut the shortcut created at Application Folder and Paste it under User’s Desktop Folder.Job was done create a shortcut to user’s desktop. Right click on the middle window pane to create a new shortcut. Also add an icon to shortcut, as done for Desktop shortcut. 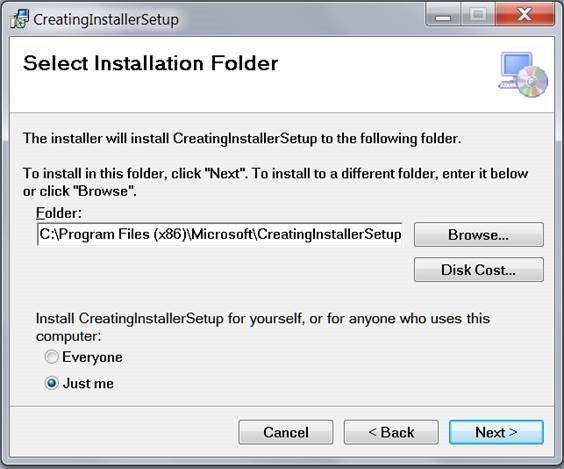 We always have the option to uninstall the application from control panel’s Programs and Features list as simple as that but how about creating our own uninstaller, that too under programs menu so that we do not have to disturb control panel. 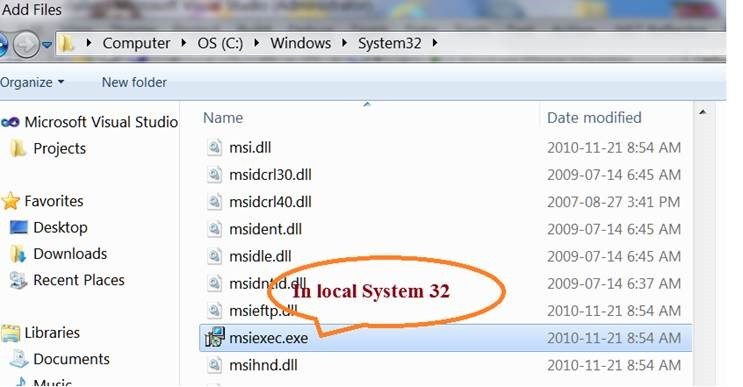 Right click on newly created system folder and browse for the msiexec.exe file in local System.Windows32 folder. 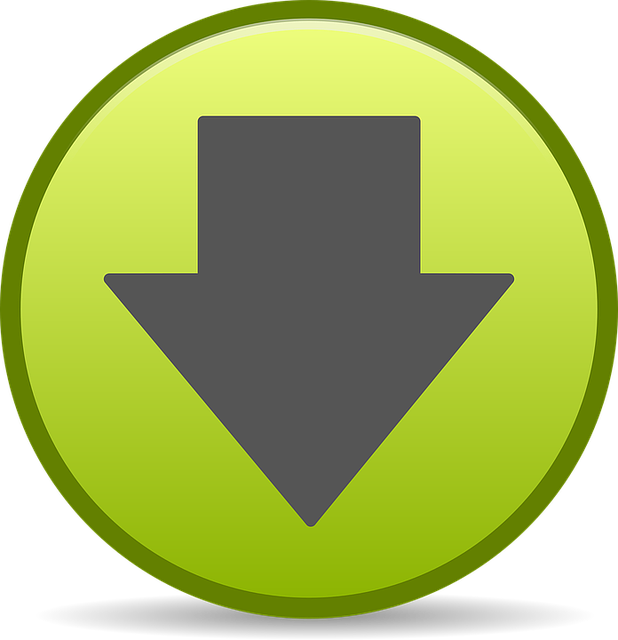 This file takes responsibility to install and uninstall the application based on certain parameters specified. 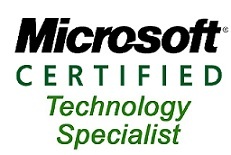 You can get the whole detailed list of parameters and their use at http://technet.microsoft.com/en-us/library/cc759262(v=ws.10).aspx , chose the one you like to. 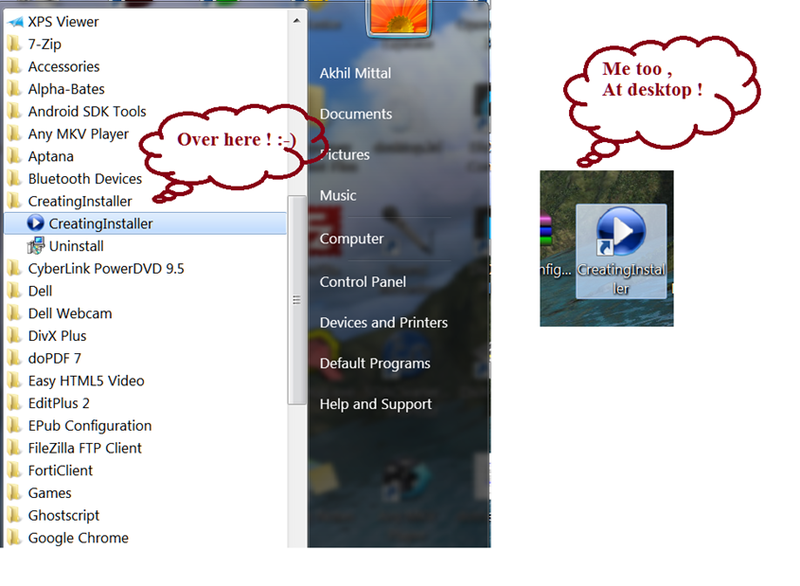 Now Job is done, we can see our shortcuts to the application created at desktop and User’s Program Menu like in below-given figure. Custom actions are the actions which contain customized functionality apart from default one at the time of installation and uninstallation. For e.g. My QC team reported a bug that when the run the application and in background uninstall the application, the application still keeps on running. 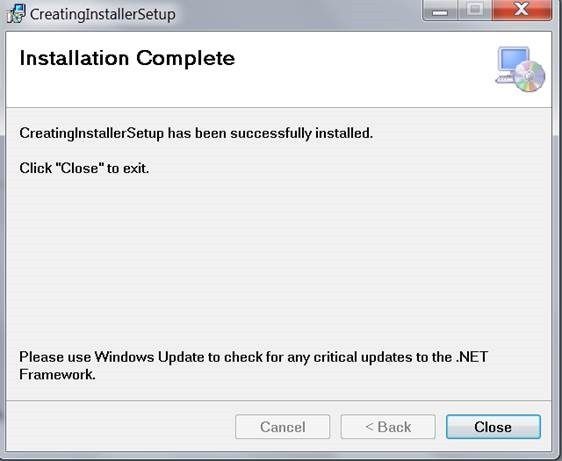 As per them, it should show a message or close while uninstallation. Hard to explain them the reason, I opted for implementing their desire in the setup project. 1. 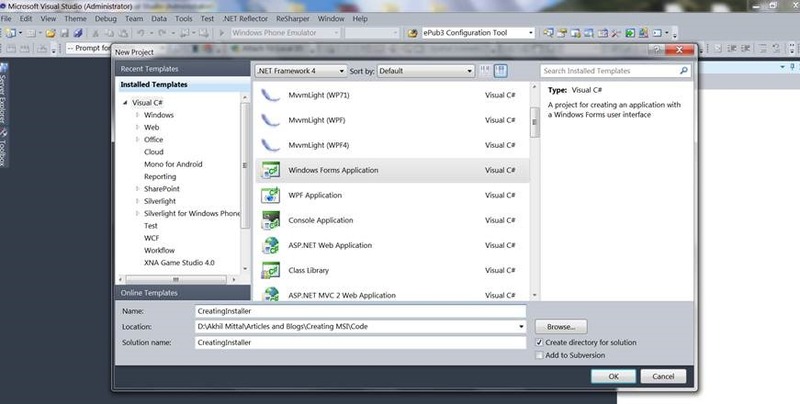 Just add an installer class to the windows application we created earlier. 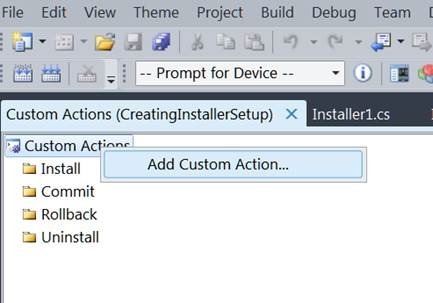 When we open the installer class we can see the events specified for each custom action i.e. for Installation, Uninstallation, Rollback,Commit. 2. 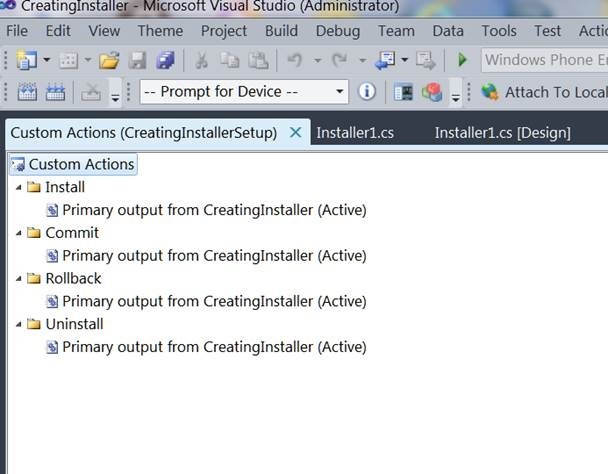 Click on Custom Actions Editor after selecting CreatingInstallerSetup project. 4. We see primary output added as custom actions now. 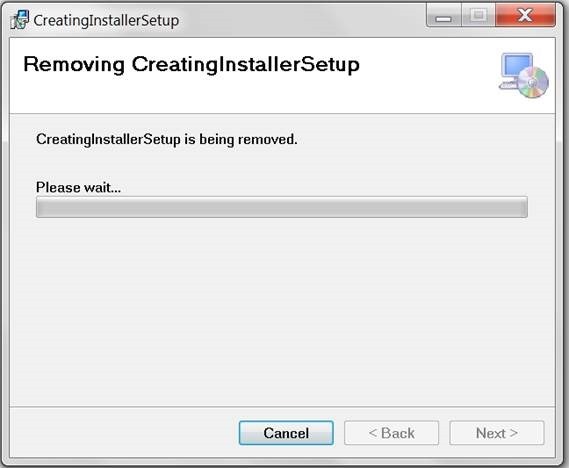 Now at the time of uninstallation, my custom action will be fired, and the application will be closed while uninstalling it. 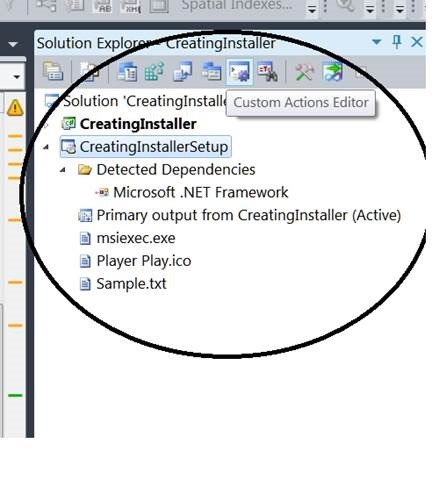 What if installation machine does not have the .net framework. We can specify our own package supplied with installation, so that our application do not depend on the .net framework of a client machine, but points to the package we supplied to it to run. Right click on Setup project, to open the properties window. Here we can specify pre-requisites for the application to install. Just click on Prerequisites button and, in the opened prerequisites window, select the checkbox for the .net framework application needs to follow and select radio button at no. 2 i.e. Download prerequisites from the same location as my application. Press OK save the project and rebuild it.